CyberBuddy has a built-in, four function, Calculator that is operable with Speech input. To get the calculator say: "Load Calculator" or "Get Calculator". 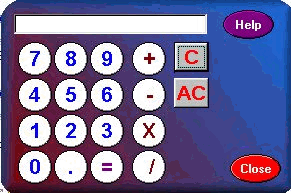 Note: When the Calculator Mode is running, all other functions will be halted. Note: If the bottom of the calculator is cut off and you are using large fonts on your computer, check the Skin size in Advanced Options.